CHULA VISTA, Calif. (CBS 8) - A group of ATM thieves has hit again, this time in the South Bay. 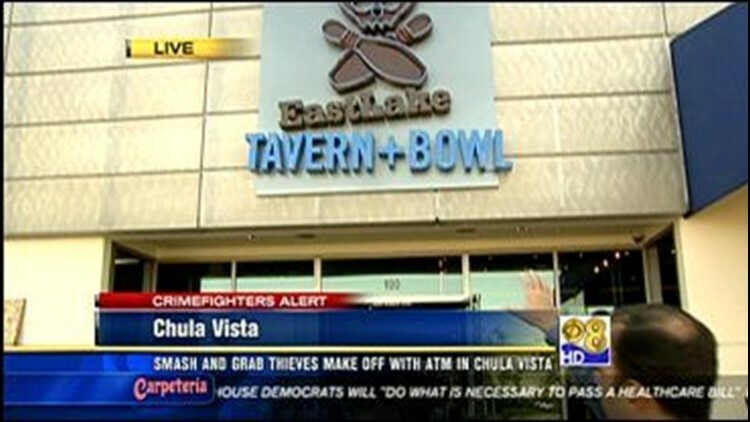 The theft happened early Wednesday morning at the Eastlake Tavern and Bowl in the 800 block of Showroom Place, according to the Chula Vista Police Department. An unknown number of thieves apparently smashed the front window of the establishment to get to the ATM. A janitor noticed the theft and called police just after 4 a.m., police said. Investigators were looking into the possibility of surveillance video of the theft.